The cajón or drum box, is a small instrument with a big voice. Pronounced “ka-HONE”, this versatile instrument is Spanish for “box” or “crate”. This portable drum is used in a variety of performance settings and music genres. Most sources indicate that the cajón is Afro-Peruvian in origin. In the 16th century, African slaves took shipping crates and played them as they would play a drum from their motherland. Sometimes, drawers were used. By the 19th century, the cajón had a distinct place in Afro-Peruvian and Afro-Cuban music. From Flamenco music to pop, rock and jazz, the cajón has steadily grown in popularity. The cajón is generally made of pine, although there are several other types of woods used today. Another layer of thin plywood is nailed to the front. One notable feature is that the top corners of the face are left loose so as to produce a slapping sound. Another distinct feature is the sound hole in the back. 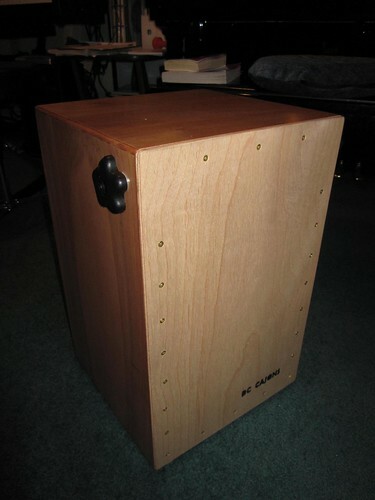 Some cajóns also have a snare (adjustable or non-adjustable). For a traditional Peruvian or African sound, the snare is turned off. There are also bongo cajóns, tubular and trapezoidal ones available too. If you live in a large city centre, chances are one of more music stores in your area is a licensed retailer of cajóns. If not, some music stores do ship worldwide. Cajóns vary in cost, depending on the make and the material used. Beginner cajóns are in the low $100's, while custom, hand-made cajóns can cost well over $600. Getting started on the cajón is relatively easy. The instrumentalist sits on the cajón, with the drum face pointing forward. Striking the lower part of the drum face produces a warm bass tone. As you move higher, the sound is higher, similar to a bongo. You can slap the loose ends as well. Vater Cajon Brushes. Photo by R-M Arca. Drum accessories can enhance your cajón configuration. You can add other percussion instruments, such as cymbals, castanets, tambourines and blocks. As well, drum brushes or specific cajón brushes expand the range of tones you can produce on the instrument. Several resources are available online to help you develop proper technique. 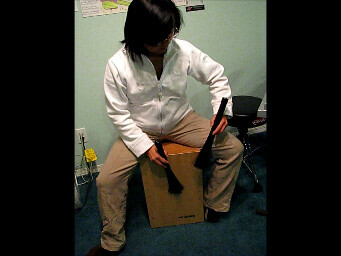 There are free video tutorials, such as those available at Learn Cajon and Framed Drums. DVD courses available by notable cajón instrumentalists David Kuckhermann and Danny Moreno on their websites or via Amazon. For those who one one-on-one instruction, contact your local flamenco club or Peruvian cultural society and enquire about cajón instructors in your area. Alternatively, some musicians do offer cajón lessons through Skype. In addition to being a portable drum, the cajón is a relatively easy instrument to learn. From its humble Afro-Peruvian roots, it has expanded into other genres – from flamenco to jazz and from pop to church music. © 2012 by Rhona-Mae Arca, MusespeakTM. All rights reserved.